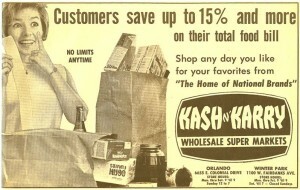 Kash n’ Karry was a Florida-based convenience grocery store that has since been absorbed by Sweetbay Supermarket. In 1914, Italian immigrant Salvatore Greco began selling fruits and vegetables in the streets of Tampa, Fla. In 1922, he and his wife, Giuseppina, opened a storefront at their home and developed it so that, in 1947, they could built a proper store under the name Big Barn. They continued to expand their business and had opened nine stores by 1960s under the name Tampa Wholesale. They renamed their chain again in 1962, this time calling it Kash n’ Karry – based on the cash-and-carry program of World War II where people would bring in their cash and carry out groceries. 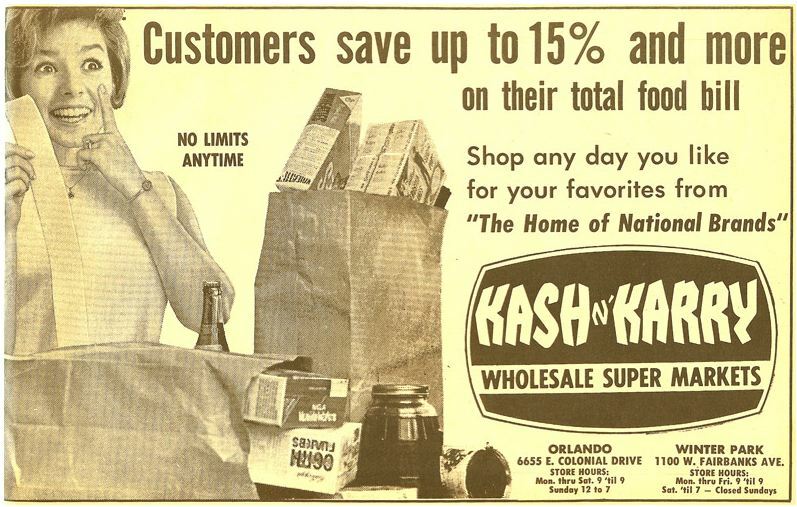 In 1979, Kash n’ Karry sold its stores to Lucky Stores Inc. of Dublin, Calif. – a subsidiary of American Stores. With a total of 84 stores by 1985, from Fort Myers to Gainesville, the company successfully marketed to both discount shoppers and up-scale customers. By 1989, Kash n’ Karry owned 117 stores, some of which offered full-service banking with First Florida Bank, florist services and a “Nature Friendly” tag system. Acquisitions also abounded for the company that year, with American Stores management partnering with Gibbons, Green van Amerongen Ltd. Success was short-lived: by 1994, Kash n’ Karry was bankrupt, in part because it was growing too fast for the available market, and there was too much competition from similar supermarket chains. Food Lion LLC purchased Kash n’ Karry in 1996 and part of the buyout allowed Kash n’ Karry to refinance its outstanding debt at a much lower interest rate, resulting in annual savings of $9 million. With the formation of Delhaize America in 2000, Kash n’ Karry became a subsidiary of Delhaize Group of Belgium. The last Kash n’ Karry store closed its doors on Aug. 29, 2007. Management of Kash n’ Karry stores was transferred in 2002 to Hannaford Bros. Co., which also handled supply. The change was made in an effort to regain control in the Florida market, but it ultimately failed. With the restructuring, however, Sweetbay Supermarkets was created, following the Hannaford model. The first Sweetbay opened in Seminole, Fla. in November 2006, and Kash n’ Karry began to roll its operations into Sweetbay Supermarkets. i have lost one of the recipes’ from when my kids were small – 30ish years ago. I know this is a long shot but would anyone have the recipe in your archives for “Lunchbox Cookies”? They were basically a peanut butter cookie but have never been able to find one as good as those. I have been charged twice by Kash & Karry for a costume i purchased yesterday. I was wondering if there is anything I need to do in order to regain my funds.